Philips launches online 'design your own TV' service | What Hi-Fi? From tomorrow, October 14th, the service goes live on Philips's dedicated website. Customers will be able to build a 7000 Series TV – either 42in or 32in – to their own requirements. You'll be able to choose from a selection of frames and stands in eight different finishes and colours, including white gloss, dark metallic, satin champagne and velvet purple (yes, really!). There's also a choice of three finishes fro the remote control. Once you've designed your bespoke TV, you can share pictures of it on Twitter, Facebook and other social media sites. Each set is made to order and will normally be delivered directly to your home, free of charge, within three weeks. Prices start from £749, with the online design service costing just £50 more than normal 7000 models sold in store. 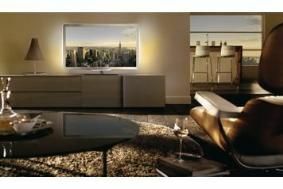 To design and order your bespoke Philips 7000 television, log on to www.philips.co.uk/design-your-tv.